I was a fat baby, chubby teenager, relatively slim adult. Over the past few years it seemed that I have been sliding back in the direction of chubbiness in mid-life. My mother even said ‘I suppose it’s good that you’re content rather than slim like you used to be’. Thanks Mum!! (I had recently remarried). In truth, I had no idea why my weight was creeping up, or why in particular it was all settling round my middle- I could only put in down to the inevitable ‘middle aged spread’ I’d heard so much about. Looking at my older female relatives they did all seem to be the same shape (my OH with his warped sense of humour calls them the ‘cubes’), and as much as I tried to resist, I had resigned myself to the same fate. I was exercising more, eating less and less but with no success on the changing shape front. Purely by chance I met top women’s nutritionist, Dr Marilyn Glenville at an exhibition. 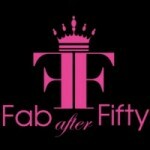 Marilyn not only very kindly offered to write for Fabafterfifty and join our ‘expert panel’(Marilyn’s first article covers natural alternatives during the menopause) but also gave me a copy of her book, Fat around the Middle. I have to say that based on all my previous efforts I was somewhat sceptical that any diet was going to make a difference. 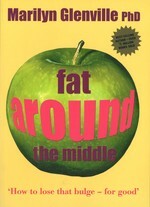 This book explained in detail why fat accumulates around your middle and how you can combat it. It made sense. My first moment of enlightenment came when on reading this book it was explained to me that I was in fact not eating enough, and what I was consuming was at the wrong time of the day, thereby prompting my body to think it was in a constant state of starvation, and therefore holding onto to everything I ate storing it as fat. The other big surprise , for me, was reading that my endless cups of black coffee (which I had always assumed had no calories ) were acting as a stimulant, releasing the stress hormone cortisol, and ulitimately turning glucose straight into fat stores around my middle. I have to admit, that the first morning of my new regime, coming from the habit of either having no breakfast or at a push a low-fat yoghurt, I did not find it easy to confront my first bowl of porridge, (in my enthusiasm to start I had missed the page where scrambled egg and other alternatives were also suggested). My mid morning snack was also something I was not used to. But, it has been working. In essence, the book recommends that you eat every 3 hours so that your body feels that food is plentiful and does not need to go into ‘starvation’ mode and replenish its fat stores. Obviously Marilyn’s book goes into far more detail in terms of what, when and why you should eat certain foods, as well as outlining what supplements would be beneficial to ‘break the cycle’. I am 6 weeks into my new regime, and cannot quite believe that in my case, by eating more I am getting results, despite, I have to confess, not having embraced the exercise element of the programme with quite as much diligence. Friends have commented and even my mother complimented me on ‘starting to look slim’ the other day. I am also starting to wear ‘favourite’ clothes which had been consigned to the back of the wardrobe. So, it seems the family ‘cube brigade’ will have to wait a little longer for me to join its ranks. Thank you Dr Glenville, for giving me my waist back! When do we think of ourselves as being middle-aged?